It’s finally here…. A recipe for vegan Angel Food Cake that actually works! It tastes like a real Angel Food Cake! There are no eggs or dairy in this cake! It’s sweet, fluffy and airy! It goes perfectly with vegan whipped cream and fresh berries! You can even make it gluten free! Angel food cake was always my favorite cake as a child and it’s been my mission for nearly 2 decades to make a vegan Angel Food Cake! It is my white whale and I have joked with my family that I will crown myself “The Veganizing Queen” if I can figure it out! After too many attempts too even count, I have finally un-cracked the code and figured out the right chemistry to make a vegan Angel Food Cake that works! Note: The taste of this cake is very close to that of the Angel Food cakes I remember. The texture is slightly different, but still very close. I don’t believe that there is any vegan recipe out there that is closer to the real deal than this one. Why is it so hard to make a vegan Angel Food Cake? Traditional Angel Food Cake calls for 12 eggs that you beat up into a meringue. It is essentially a meringue with some flour and sugar baked in. It is super light, fluffy and spongy. Most vegan egg replacers work as a binder to hold your baked goods together and you can use them in place of eggs when a recipe calls for 1-3 eggs, but they do not work to replace something that is mostly egg. You can use aquafaba (the liquid from a can of beans) as a replacement for egg whites to make meringue, but it doesn’t have enough protein content to bake like egg whites and will collapse in the baking process. What goes into a Vegan Angel Food Cake and why? Cream of Tartar– this helps to break down the protein and stabilize the meringue. You can read more about the chemistry here. Powdered Sugar– to sweeten the cake without weighing it down. Garbanzo Bean Flour (aka chickpea flour)- For extra protein added to the meringue to hold it together. *This is essential! Flour- you can use white pastry flour or my all purpose gluten free flour blend. Can this vegan Angel food cake be made gluten free? The cake is slightly more authentic tasting when made with gluten flour, but if you need it to be gluten free, my gluten free flour blend is the only type of gluten free flour that will work. I created this flour blend by default in one of my many attempts to get this recipe to work. I was trying to get a flour with a high amount of protein to bake up like wheat. It worked in this recipe and then I tried it in my other gluten free baked goods and it has worked perfectly in everything else too. Note: You must double the amount of garbanzo bean flour when making it gluten free. 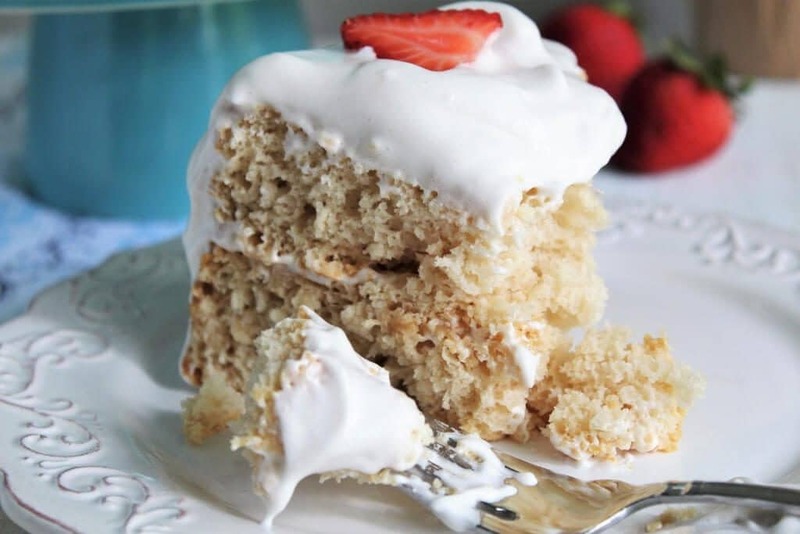 How do you make a vegan Angel Food Cake? Pre-heat the oven to 330° F.
Start with ¾ cup of aquafaba from a can of chickpeas. Place it in a large mixing bowl with 1 ½ tsp. of cream of tartar. Beat the aquafaba for 6 minutes on high until you get a fluffy meringue, then add 1 tablespoon of vanilla extract to the meringue and beat again for another minute until it turns white again. Add the powdered sugar slowly while continuing to beat the meringue on high for another 1-2 minutes. After you have beaten the aquafaba for at least 8 minutes add a tablespoon of garbanzo bean flour and beat for another minute. Turn off the mixer and use a spatula to fold in the flour ¼ cup at a time until it is all incorporated, but DO NOT OVER MIX. (Once the flour has been added the meringue will start to deflate. Quickly pour the batter into an ungreased Angel Food Cake pan. Bake at 330° F for 1 hour. (It will pull away from the edges and be slightly golden when done). Allow to cool in the pan. (Do not flip upside down like you would a traditional Angel Food Cake). Once it has cooled to room temperature, cut it out of the pan with a large knife. 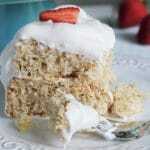 Frost with my vegan whipped cream recipe before serving and top with fresh strawberries or a simple strawberry sauce. Follow the recipe exactly! Measure carefully and use a timer to make sure you are beating the meringue long enough. Sorry, but no substitutions can be made to this recipe. I have tried it with a ton of variations and slight changes to this recipe cause it to fail completely. Do not taste the batter once you have added the garbanzo bean flour. It tastes terrible before it is cooked! 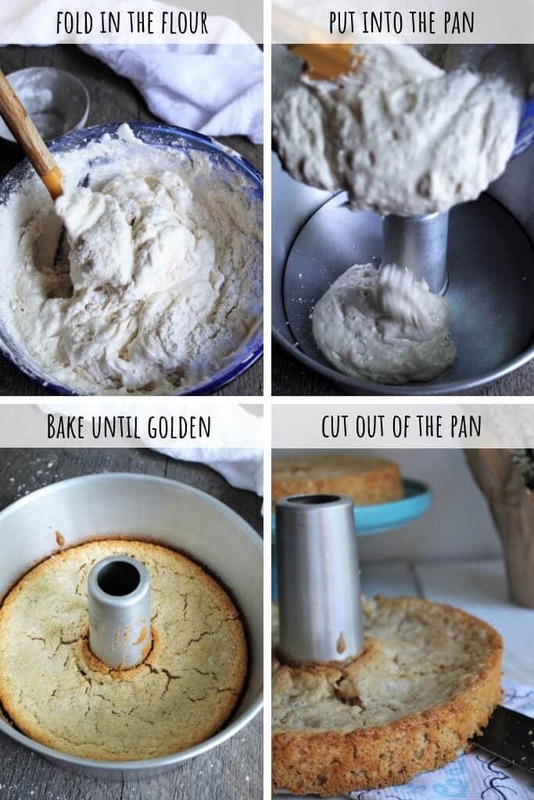 You must use an Angel Food Cake pan to be able to remove the cake without having it fall apart. Frost with whipped cream just before serving. This cake will be about 3 inches high. I have tried to double the recipe, to make it the height of a traditional Angel Food Cake, but it does not work. If you want a larger cake, simply make a double batch and bake it in 2 separate cake pans and stack them on top of each other. Slice with a serrated bread knife. 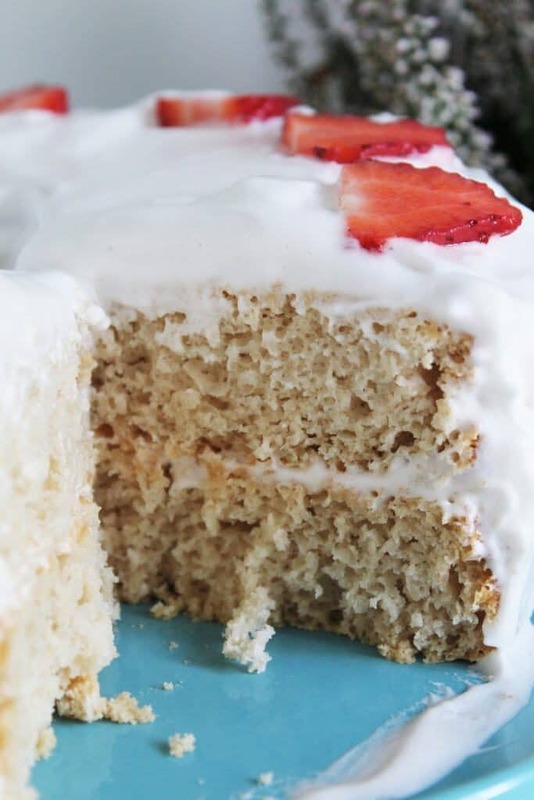 Did you make this vegan Angel Food Cake? Leave a comment and let me know how it went and don’t forget to pin it for later! 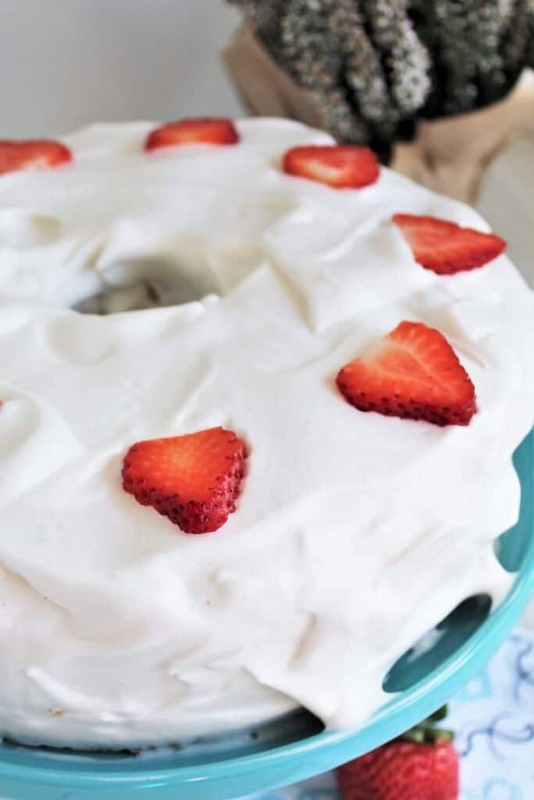 A vegan Angel Food Cake with vegan whipped cream topping. Put ¾ cup of aquafaba from a can of chickpeas into a large mixing bowl with 1 ½ tsp. of cream of tartar. Beat the aquafaba for 6 minutes on high until you get a fluffy meringue. 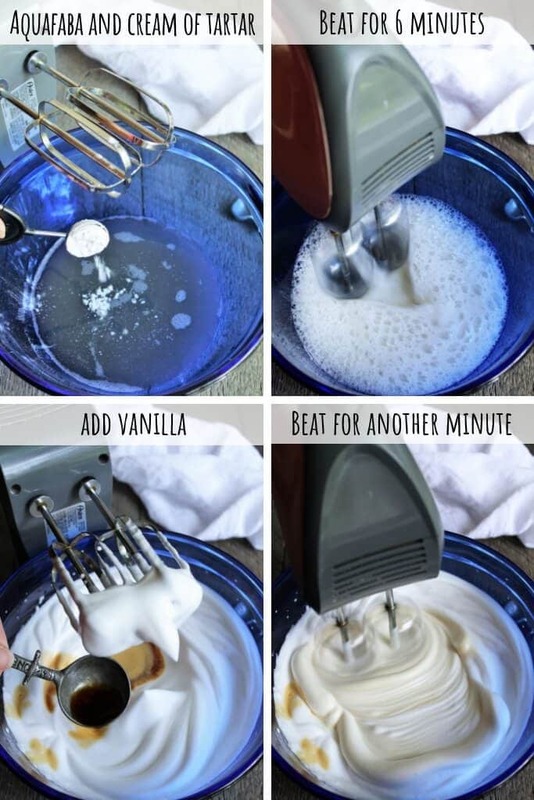 Add 1 tablespoon of vanilla extract to the meringue and beat again for another minute until it turns white again. After you have beaten the aquafaba for at least 8 minutes add a tablespoon of garbanzo bean flour and beat for another minute. 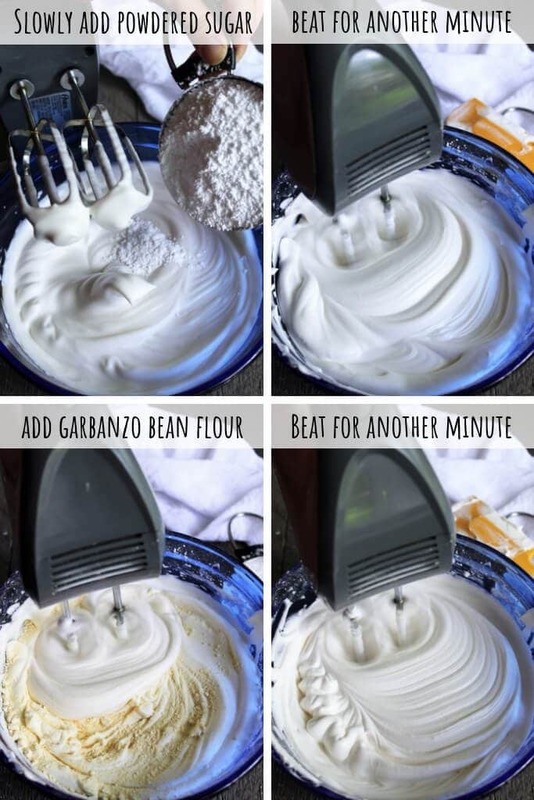 (Use 2 tbsp of garbanzo bean flour for gluten free). Turn off the mixer and use a spatula to fold in the flour ¼ cup at a time until it is all incorporated, but DO NOT OVER MIX. (Once the flour has been added the meringue will start to deflate). Frost with my vegan whipped cream recipe before serving and top with fresh strawberries. Be sure to double the garbanzo bean flour using 2 tablespoons instead of just 1. Make sure to use my gluten free flour recipe. (I developed the mix especially for this cake and no other gluten free flour works as well)! number 3 of total egg replacements needed. having enough binding power. Thanks for posting your recipe. 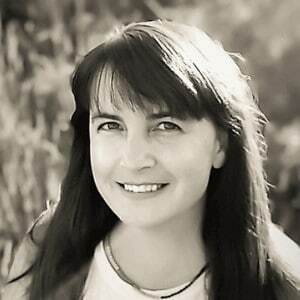 Hi Monica, I read a research paper a few months ago about the chemistry details of building foam for lattes and although the temperature, density, pH, etc are different for your cakes, it is probably also ttue for them that high protein to fat ratio helps with making stable smaller aerated bubbles that bind to the side of the cup and build from there. Thanks again for posting your recipe! This looks light and delicious! Of course I love that it can be gluten free too! Hi! Looks delicous and I cant wait to try! Is it possible to find a nother sub for the creame of tartar?